In 1958, a group of committed citizens laid the groundwork for what is now one of the largest residential and outpatient substance abuse treatment programs in the United States. Armed with a desire to help others struggling to overcome addiction, they opened Crossroads’ first campus, Crossroads East, in Phoenix in 1960. This began the 50+ year legacy of Crossroads changing lives, one person at a time. Crossroads continuously works to expand and improve our programs to meet the rapidly growing need for addiction services in Arizona. We operate multiple large campuses, serving over 2,500 men and women annually. Today, Crossroads is an Arizona Department of Health Services licensed substance abuse treatment provider with proven expertise in serving addicted individuals through the provision of high quality, successful, and affordable peer-guided residential and outpatient programs. Peer-guided care is a service that is performed by ‘our peers,’ or individuals that have successfully completed substance abuse treatment programs and related recovery programs. Results show that our treatment methodology, 12-Step emphasis, a full menu of support services and community collaboration provides an effective basis for long-term recovery and promotes success. Through our program, clients develop the skills and confidence they need to transition successfully back into the community as healthy, self-sufficient, sober individuals. Crossroads offers cost-effective programs that work. Our campuses provide a safe, healthy and highly structured environment for those committed to achieving sobriety and self-sufficiency. Our programs promote recovery, family reunification, and successful reintegration. We can help you or someone you love overcome addiction. 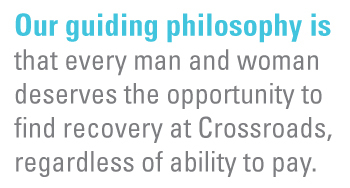 Our guiding philosophy is that every man and woman deserves the opportunity to find recovery at Crossroads, regardless of ability to pay. Each year, we provide more than $300,000 in scholarship assistance to individuals who are unable to afford treatment. We are also the largest Arizona substance abuse treatment provider for Veterans under contract with the Veteran’s Administration and we expertly serve other special populations such as ex-offenders and homeless individuals through federal and state contracts. CORLATE health care services will transform the way substance abuse treatment is being delivered in this country. We’re a visionary company, thinking out of the box on alternative processes to help the suffering person with addiction challenges. We’re taking our program to the nation to provide a successful Peer-Guided Care™ model with proven expertise in serving addicted men, women, and Veterans through the provision of high quality, successful, and affordable residential and outpatient recovery programs. With a small footprint in the sand, multiple programs and a staff consisting of counselors and Peer Support Specialists alike, CORLATE boasts a proven business model that is unique in the Substance Abuse Treatment industry. Our model offers a comprehensive residential and outpatient treatment package that is an effective, affordable alternative to mainstream treatment programs. CORLATE will provide treatment for individuals that may not be able to access it otherwise. We are the largest provider of residential substance abuse treatment in the southwest for the Medicaid client. CORLATE’s core program, outside of the classroom, is based on the 12 steps of recovery. However, CORLATE campuses offer additional recovery options such as the Wellbriety program (the Native American way through the 12 steps) and Smart Recovery (Self-Management and Recovery Training). We understand that recovery is a unique and individual process allowing for the client to forge their own journey. Inside the classroom, we offer an educational platform for clients to acquire life-changing skills to propel their recovery to a new level. Honor and emphasize 12-Step recovery programs in our service to residents and the community. Believe in the dignity and worth of all human beings and are committed to serving individuals towards living a life free of substance addiction. Are committed to delivering high quality, comprehensive, empathic, hopeful, effective, and affordable services tailored to the needs of those we serve and our community. Are committed to providing services that enable individuals to reintegrate into society with enhanced recovery, social, life, and emotional skills and with the highest degree of self-sufficiency and self-worth. Are committed to being a good neighbor and serving the community by sharing our resources and providing services based on the values of 12-step recovery programs. Are committed to integrity, ethical practices, professionalism, and fiscal responsibility. Value relationships with alumni, donors, volunteers, colleagues, and community members. We provide a safe and healthy residential environment for men and women committed to achieving sobriety and self-sufficiency. To contact any of our campuses, please call 602.263.5242.